Opened by HRH The Duke of York in 1989 this volunteer run museum has a unique collection of rare aircraft, many of which enjoy top benchmark status on the National Aviation Heritage Register. All profits from admission fees etc. go towards conserving and improving the collection. The Helicopter Museum is a registered charity. No 281053. Situated just off junction 21 of the M5, this is the only helicopter collection in the country and the largest of its kind in the World! 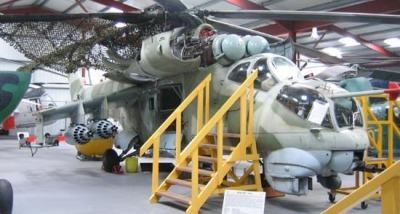 The Museum has over 70 full size aircraft on display ranging from an impressive Russian gunship to a massive Super Frelon 36 seat helicopter, and from the Queens own helicopters to the veterans of the Vietnam conflict. Also on display is the current world speed record holder and a selection of unusual gyrocopters. In the ‘Restoration Hanger’ visitors can see the latest Helicopter restoration projects and chat to the volunteers who give up their time to work on the aircraft and who help preserve aircraft of historical aviation importance. Highlights on the Museum’s event calendar include it’s monthly ‘Open Cockpit Days’ where visitors can take the pilots seat in one of the museums many aircraft and be shown the controls by an experienced guide and ‘Spotter Weekends’ where visitors can join specially organised guided tours and gain access to the Museums reserve collection of aircraft that are not on generally display to the public. The museum also hosts regular “Helicopter Experience Flights”. During the 15 mile flight along the local coastline passengers get the opportunity to view Weston-super-Mare and the surrounding countryside from a totally unique new angle and at the same time learn how rotorcraft work and fly via commentary from the experienced pilot. All flights take off and land from the museums very own active Heliport (where you can often observe visiting military and civil aircraft). Themed Children’s Play Area and Free Parking. Group bookings, Birthday Parties and Corporate Events catered for.